Who were The Three Kings? Only the Gospel of Matthew makes reference to an unknown number of Wise Men, but we know that they came from the east (Matthew 2:1), meaning east of the Holy Land, and arrived with Three Gifts of Gold, Frankincense and Myrrh. However, Holy Tradition of the Catholic Church acknowledges that the principal members of the entourage were Kaspar, Melchior and Balthazar, and are recognized as Saints. Various traditions hold the Three Kings as being from various kingdoms of Africa and Central Asia, including Babylonia (modern-day Iraq), eastern Africa (due to the (presence of frankincense), India, and most commonly, Persia. Often at least one King is depicted with African features, while all three are usually depicted in Oriental garb associated with Persia attire, as is seen at the Basillica of Sant’Apollinare Nuovo in Ravenna, Italy, and at one point in early Christian history, Nativity Church in Bethlehem. Were they Wise Men or Kings? Due to confusion in translations of texts into Latin, the Greek word magos has been interpreted as wise men, learned scholars, astronomers, or even sorcerers. However it appears that another tradition of the Wise Men being Kings came from biblical references of the Messiah being revered by Kings. That being said, it should be noted that Kings were often the most educated and learned of their people, and often studied astronomy, so there may be a truth behind the concept of the three being kings. Wise Men or Kings, we know little about their lives, their journey to and from the Holy Land, and their latter days. Some traditions hold that the Three Kings were martyred for their faith in Christ. 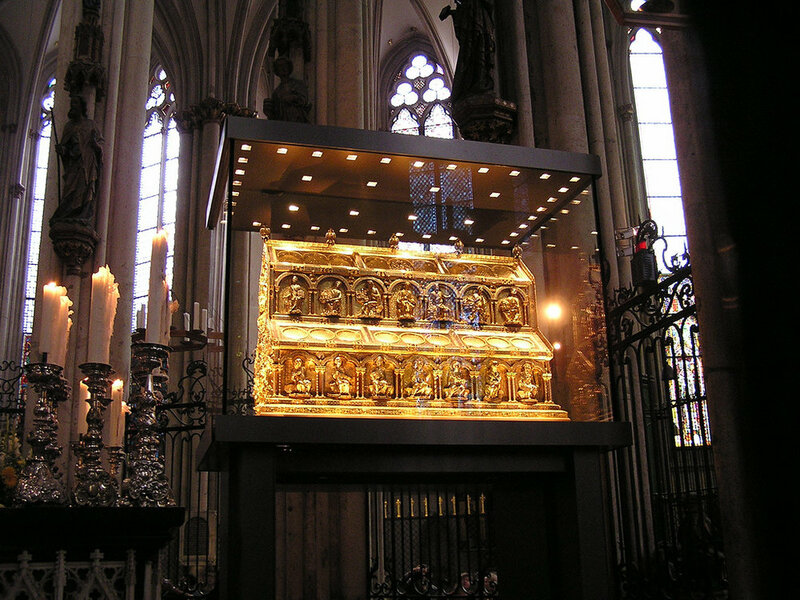 Interestingly enough, what little we have in terms of physical evidence is to be found at The Shrine of the Three Kings at Cologne (Köln) Cathedral in western Germany near the French border. Known as Der Dreikönigenschrein, the Shrine of the Three Kings is the principle reliquary of the Cathedral, the tallest twin-spired church to be found anywhere in the world and a jewel of German Catholic architecture. Tradition holds that the relics of the Three Kings were brought by Saint Helena from the Holy Land to Constantinople after her 4th century pilgrimage, and were eventually transferred to the Archdiocese of Cologne by Frederick Barbarossa, Emperor of the Holy Roman Empire, as a spoil of his military campaign in Italy. A magnificent gilded reliquary of immense size, its creation took nearly 30 years at the hands of skilled craftsmen Nicholas of Verdun. 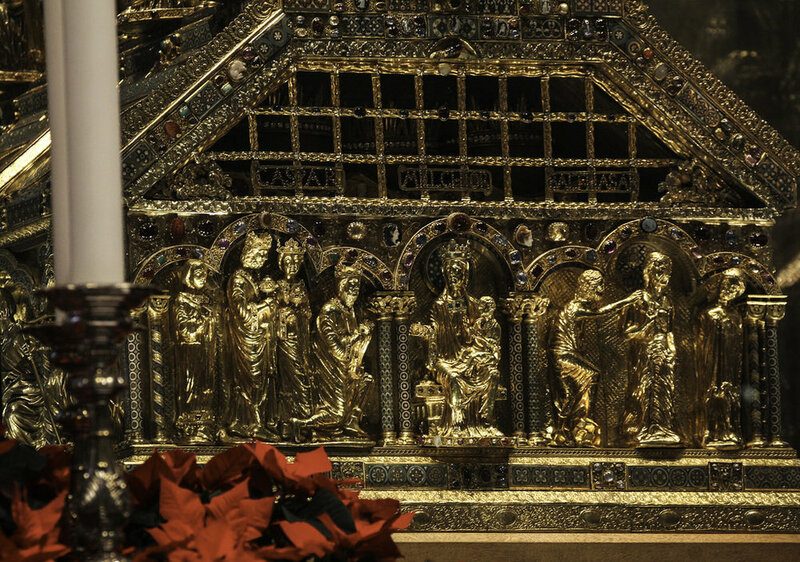 The ornate reliquary takes the form of a triple-stacked sarcophagus and measures nearly four feet in width, five feet in height, and seven and a half feet in length. In of itself, its value is immeasurable as a work of art, but the relics of the Three Kings were considered a treasure beyond compare by pious Christians of the Medieval ages, and the Cathedral became a major center of pilgrimage, as evidenced in a statue of Saint Christopher, patron of pilgrims, on one of the columns of the nave. Even today, the Cathedral receives several thousand pilgrims on a daily basis, who, as the Three Magi, have journeyed far in the hope of greater understanding of the mysteries of heaven and God’s greatest gift to the world. Visit the website of the majestic Cologne Cathedral here: Cologne Cathedral website. Our continental European tours for Europe, especially France and Germany, can easily include a visit to The Shrine of the Three Kings at Cologne Cathedral. Don’t forget to ask about adding a trip to Ravenna to see the mosaic of the Three Kings at the San’t Apollinare Nuovo Basilica! For more information on how to plan your next pilgrimage, contact info@goodshepherdtravel.com.